I am so excited to welcome Jessica Freeburg to the blog today. She is a fellow Clean Reads author, and her debut novel, Living in Shadows is a great read. This book kept me turning the pages long into the night. I had to constantly remind myself to edit because I kept getting lost in Vivian's story. 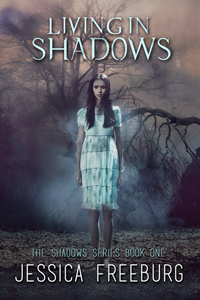 If you love the paranormal, I highly recommend picking up Living in Shadows. Jessica not only writes about the paranormal, she investigates it too! I love checking out haunted sites in America and abroad. It provides great inspiration for writing. I began performing paranormal investigations about 3 years ago after signing with my literary agent. She encouraged me to create a name for myself and connect with my potential audience even before my manuscript was sold. Since the novel she was representing was a paranormal piece, and because I’ve always loved those reality ghost hunting shows on T.V., I decided I should visit haunted locations and blog about it. That idea eventually led to me forming my group, Ghost Stories, Inc. We are a group of creative professionals who go to historic and often reportedly haunted locations for creative inspiration. As a group, we’ve been to a variety of places, including locations in California associated with the Charles Manson murder spree. One of my favorite group outings was our hike through the wilderness to find Spahn Ranch. It’s not marked, and the buildings have since burned down, so it was a struggle to find it, but once we did, it was very emotional. Just being in the place where Charles Manson sent his followers out and instructed them to “do something witchy,” caused our giggly group of explorers to become silent. Our mood just shifted. It was incredibly surreal. We also performed an investigation at the home of David Oman, which is located near the entrance of the estate where Sharon Tate and her friends were murdered by the Manson Family. His home has been featured on a variety of “ghost” shows on T.V. Walking up the road leading to the house in the dark, we realized, this is the path the murders walked that night. It was heart wrenching to think about what their intent was as they walked up that same road. Some people think visiting places like that is morbid, and I suppose it can be. But for us it’s not a celebration of death or murder, it’s not even really about looking for ghosts or proof of the paranormal. It’s about connecting with the past in a way that might allow it to inspire creative works that can invoke thought. We don’t focus on the ugly part of death, but on the beauty of life and that unknown ever-after. There’s a quote attributed to George Santayan that I love. “Those who cannot remember the past are condemned to repeat it." That inspires me, especially as a children’s author. I want to make reading fun, so I love creating a good story that keeps the reader turning the page, and I like to use the voices from the past to inspire my work…to bring those voices alive for the next generation of readers. Sometimes I can do that through a work of fiction like the SHADOWS SERIES, and other times, it’s through nonfiction, like with my next book about the Holocaust which is part of a series called TANGLED HISTORY that is due out in the fall of 2016. Writing LIVING IN SHADOWS for me was a journey through my own questions about spiritual energy. Throughout my life, I’ve seen things that I couldn’t understand, things that I can only classify as paranormal. Through my personal faith, I’ve come to a place of accepting these things as a sign that we live on beyond this lifetime. Some people think ghost stories are scary, but I think they’re cool because it only confirms to me that we live on. And when we do have what seems to be an interaction with a spirit during one of our investigations, I am humbled and feel honored that they would choose to interact with us. I feel so lucky that I get to make money as a writer. And I love that I can blend my passion for history and the paranormal into my work. As strange as it may sound, ghost hunting has made me a better author, a more thoughtful human and it has allowed me to connect with my readers on a much more personal level than I could otherwise, and that is a huge blessing. Vivian is able to see things other people can’t. Things like shadows that move without a maker and hover over people, feeding their depression and fueling their self-destruction. She also sees kind spirits, guiding and guarding their loved ones against the shadows. When Vivian’s mother and brother die in an accident, the only option is to reunite with her estranged father at his new home in another state. Unfortunately, there are shadows in the house, and Vivian tries to avoid them during this time of heartache and anger. Her brother’s spirit warns about an especially strong shadow at the top of the stairs, one inhabiting the bedroom of a girl who disappeared fifteen months ago. Once the spirit of the missing girl reaches out to Vivian, she learns the girl was murdered in that bedroom while staring into the eyes of a trusted person possessed by the shadows. The girl’s spirit is restless, her undiscovered body lies buried in a shallow grave, not far from Vivian’s home. With her brother’s assistance, Vivian searches for answers in hope the girl’s spirit can move on. But the shadows are intent on protecting the killer’s identity. They stalk Vivian. Her life depends on releasing her own pain and anger, because the shadows won’t stop until she stops searching…or until death finds her too. What Happened to Mr. Nice Guy?